How do I export data from Stockbook to other equipment or software? Stockbook provides you with an easy method of creating a master CSV (comma-separated variable) file, containing selected information, for easy transfer to other equipment or loading into other software. If you do not wish to involve all animals, select the animals for which you wish to export specifed data, via the Current Animal listing. Click on the File > Export Options > Master CSV File menu option. Select the relevant criteria that you would like to export. For more details notes on selection, see below. Click on the Export Master button. You are now able to import this file into other equipment or software. You have a number of options as to which data is to be exported. The data is divided into sections (types) e.g. weights, traits. To see the information available for each section, click on the + button to the left of each section. Similarly, click on the - button to compress the list. Within a section, simply tick any item you want to include in the export. To remove an item from your selection, untick it. You can include all items in a section by ticking the section name. Having specified the details required, for some sections you then have the option of how many of the most recent recordings of each item you require. For example, if you want the 3 most recent weights, type 3 against the Weights box. If you are exporting electronic Ids. you can choose the EID export format. All EIDs are held in Stockbook as 3 digits, a space, 12 digits. If you choose the 'replace blank' option, you will be asked to indicate which character you want to use instead. EBVs. You can specify which type of EBV is required. Only those traits that you have marked as in-use in the Setup/Performance/Traits Analysis System will be displayed as options for export. Accuracies are not included in the export. Treatments. Only the most recent treatment for each required animal can be exported. Traits. Only the traits that you have marked as active (Setup/Performance/Traits) will be displayed as options form export. Draft. If this section is ticked, any of the required animals that are in a user list that contains the word DRAFT followed by just a number e.g.MY DRAFT 1 will have the number exported as the draft. This means that you can use all the power of Stockbook (for example the very sophisticated drafting options in the laptop screen) to create simple user lists for drafting. Cancel/Exit - close the window. Save - remember the current settings. 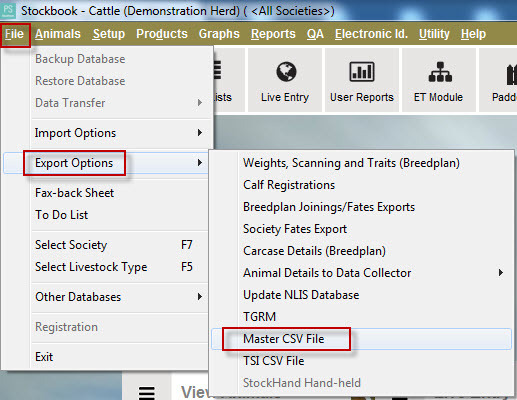 Export Master - create a CSV file (You will get a Save As screen appear that allows you to save the file to any location you chose with whatever name that you want), containing all the required data for the specified animals. This file will have a header record, documenting each of the data items contained in it. 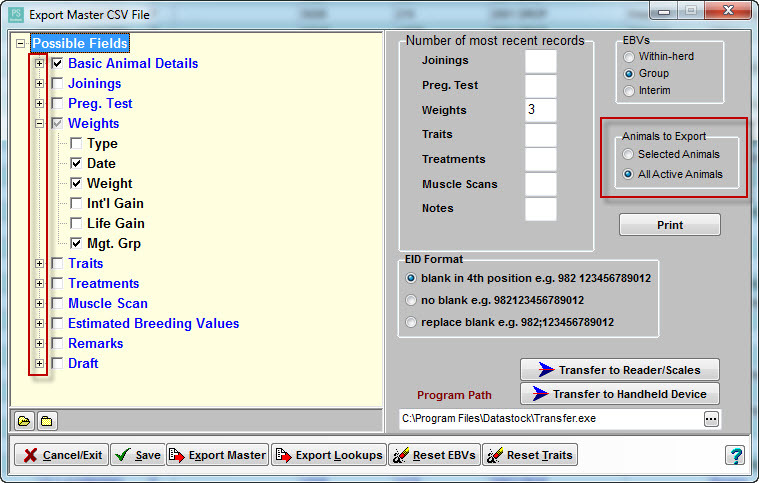 Export Lookups - you can also create a CSV file for each of your product, breed and observation code (stage) lists. This makes it simple for them to be imported into other equipment. These files will be created in a special folder (you will be notified what it is) and will be named products.csv, breeds.csv and stages.csv respectively. Reset EBV's - If you have changed the names or usage of any of the EBVs, you will need to click on this button to see the new settings. Reset Traits - If you have changed the names or usage of any of the traits, you will need to click on this button to see the new settings. Print - You can print your current settings, for easy faxing to your 3rd-party supplier, in case any customisation is required. Transfer to Handheld Device - if you own a handheld device with supporting software to transfer data in the csv file into that device, you can load that software from within Stockbook. You will need to provide the full path to that software i.e. the folder containing the software and the name of the software. You can either type in the path and name, or click on the ellipsis button to locate the program on your computer.